To me, the term "knitted brow" conjures up rather painful images involving foreheads and knitting needles. 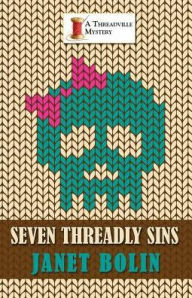 Then I saw the cover of the large print version of SEVEN THREADLY SINS by Janet Bolin, and I had to read the book. Imagine my shock to discover that SEVEN THREADLY SINS features me, my daughter, and our friends in our little village known as Threadville. It tells about how we found the clues and evidence and put them together to finger the murderer of that rather horrible man, Antonio, who called himself a fashion designer and accused my daughter and friends of committing "threadly" sins. Of all the nerve! And then, speaking of nerve, since I was near the appalling man, and I had my arm upraised when he collapsed, the police actually considered that I might have hit him. I assure you that I did not touch him. Shh--don't tell anyone, but I would have smacked him, and for a very good reason, if he hadn't fallen down before my hand could connect. And then I discovered that there are five mysteries taking place in Threadville. Well, I knew about the murders, and how my friends helped solve them, but I didn't realize that this Janet Bolin had written and published stories about the murders, and about us. It's enough to make one, well, knit one's brow. I spin and weave, but I do sometimes pick up knitting needles, and when I saw the covers of the two books that I'm in (I didn't show up in Threadville until after three mystries had been solved), my first thought was that the cover artist had cleverly provided me with knitting patterns. The Argyle pattern where skulls replace some of the diamonds makes me laugh, and I suppose I might try that one, too. Wouldn't socks be amusing? Do you knit, or merely knit your brow? If you knit, do you ever find patterns in unlikely places, like on the covers of books? 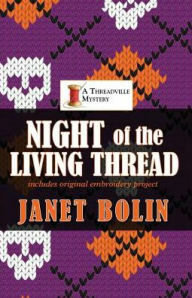 The Threadville Mysteries are available as paperbacks, e-books, and in large print. Find booksellers here. Connect with Janet on facebook and twitter. Happy reading, and happy knitting! Knitting and writing do indeed go together. I am a plain and purl kinda gal. Nothing fancy like those Argyle socks. It's when I knit that I do all my plotting. Must pick up Night of the Living Thread. Love the patterns! Looking forward to the books! 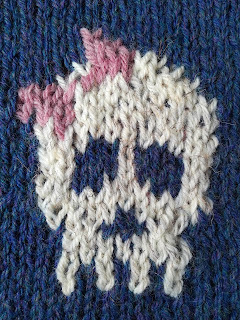 Would love to see a pattern for knitting the skulls - what a great pair of socks those would make!! !